Ever since Nolan finished his work with the incredible Dark Knight trilogy and began, alongside David S. Goyer, to spearhead the new direction for Superman's return to the big screen, fans have been overwhelmed with excitement and hype; will this be the best Superman film ever? 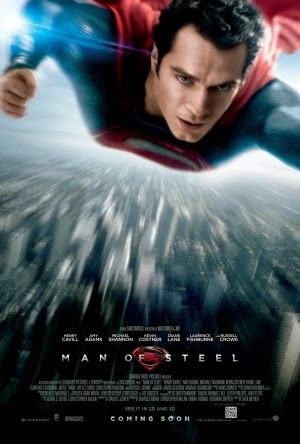 Will it make up for the more than disappointing Superman Returns from 2006? Well, after over two years of anticipation, the finished product has finally arrived to underwhelming reception - but I would like to be everyone's beacon of hope and assure you: Snyder and Nolan have done the man of steel justice without a doubt. Sent to Earth from his dying homeworld many years ago, Clark Kent (Henry Cavill) is alienated from society due to his superhuman abilities which he attempts to hide from those who disdain him. After years of searching for his own origins, Clark stumbles across the expansive Fortress of Solitude which seems to finally store answers for where he belongs. His powers are recognized as a source of hope and good for the world - leading him to become the mighty hero Superman and stand against one of his own, the menacing General Zod (Michael Shannon), whose arrival at Earth threatens the very existence of humanity and its homeworld. Man of Steel is incredibly explosive and action packed - its gargantuan $225 million budget is exploited to create incredible battle scenes and truly make you believe a man can fly. The production design is beyond exceptional - everything from Superman's actually cool costume (without red pants!) to the magnificent portrayal of Krypton benefit the film hugely. Everything is filmed in a handheld and actually solid fashion; fight scenes are never clustered onto badly framed shots and the film puts a strong and gorgeous emphasis on lighting and expansive locations. Viewing the film in IMAX is a massive importance - while the 3D is conservative and often pointless, the stunning quality of visuals and sound really add to the experience. Well, sound less so, as the somewhat repetitive soundtrack by Hans Zimmer is drowned in overly noisy smashing during the admittedly enjoyable battle scenes. But sometimes Man of Steel is a little too determined to be easy on the eyes (albeit not the ears) - the characters suffer a tad, although the story at least makes a strong effort to inject depth and focus. It usually works, as Clark Kent is a likeable character portrayed brilliantly by Cavill, and his transition to Superman is handled in a way that prevents pacing issues. Clever use of flashbacks help us to explore the character without a boring wait for his alter ego to show up, and his development is shared equally alongside love interest Lois Lane (Amy Adams) who is a little bland but still likeable. It's a shame the focus on the antagonistic Zod wasn't as ideal; he's a little dull and Shannon really overdoes the sinister act at times. He still makes for an intimidating villain, but more could've been done to polish his character. Man of Steel is jam packed with intense action, likeable characters and solid performances. It lacks positivity at times and leans towards a depressing vibe a little too much, but what it does it does very well. Never has a Superman film in the past been able to capture the chaotic nature of the protagonist's flight and combat until today and Singer's effort from 2006 is not even in the same ball park. It is sure to divide fans in areas and a lot of work could've been done to polish some of the dialogue and focus in Goyer's script, but Snyder's stylish direction allows the film to become a hugely intense and emotionally satisfying summer hit.